Left: Elsa Tomkowiak, work in progress. Right: Mary Sue, Thinking About the Show at TMH. Courtesy of the artists and The Merchant House. In celebration of Amsterdam Art Weekend 2017, The Merchant House has asked Elsa Tomkowiak and Mary Sue to interpret the gallery’s building, rich with Golden Age symbolism, as a contemporary public sphere. Using both spoofing techniques and serious art, they—Tomkowiak in painting and Mary Sue in video, sculpture, and photography—join forces to give the interior topography a provoking and provocative face-lift. In so doing, the artists also address individually, and emphatically with respect to their art, the underlying theme of TMH’s Making Things Happen: Young Artists in Dialogue cycle: How does a young artist inscribe herself in the history of an art medium? In the case of Mary Sue and Tomkowiak, the question refers to performance and a performative gesture in art making. Elsa Tomkowiak (1981, France) has been in search of the most radical painting tools beginning with her art studies at ENSA of Dijon. Reflecting her predilection for an open gesture and the day-glow colors of a personal gradient, her earliest color interventions were made in the snow and on large vinyl surfaces suspended above industrial waste. 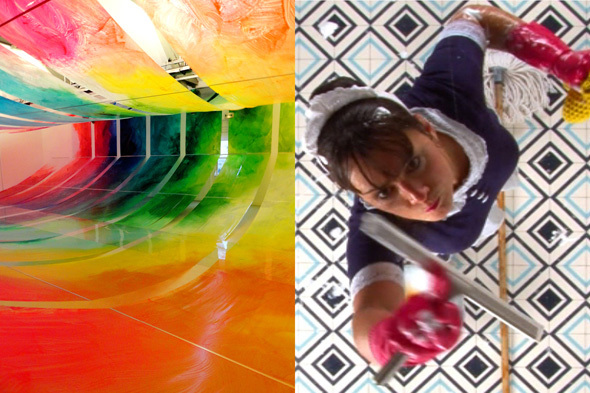 Wielding broom-like brushes, she adopted a method of applying layers of multicolored paint to translucent or solid bands of plastic sheeting, or to massive spheres that can be positioned to redirect light and restructure the space. Her recent commissions and residencies include a swimming pool (Mönchengladbach), an opera house (Nantes), an abbey (Angers), two bridges (Saint-Gervais, Quebec), the glasshouse of a spa (Pougues-les-eaux), as well as landscaping during major urban events (Offenbach am Main, Amiens, Verdun). Mary Sue states that otherness starts within oneself, that she was born between 1979 and sometime now, and that her gender identity might be female or science (also relating to her top performance in physics) fictional. Under this sobriquet, she has pursued a relentless career (not by-passing ENSA of Dijon for art studies) performing in her own videos, making costumes and decor, posters and books, but also sculptures, installation objects, and photographs—all fabricated to perfection by hand and surrounding the exploits of the brilliant, fictive Mary Sue. According to co-curator Hubert Besacier, we find her in situations—be it in a gallery show or on display at a Nike store—that are “totally desperate, and therefore hilarious.” Mary Sue’s crafted take on childhood and loss, Le Flotte, was seen this summer desperately afloat on the river in Amiens, France, for the Art, villes et paysage festival. Sweeping through TMH’s walls, floors, windows, ceilings, and terraces with the exigency of their craft, both artists construct a probing play of color as a cultural value. With confident proficiency in their medium, they are able to create a unique artistic exchange that invites viewers to join in and enjoy. The relational and artistic aspects of their dialogue are, however, both real and illusory, intimating telling slippages in modern day sociability and bonding. A self-supporting art space, TMH presents and sells contemporary art. Established by Marsha Plotnitsky, Artistic Director, in 2012 as a modern take on the Amsterdam tradition of a merchant, it promotes a cultural dialogue in the city. It has organized thematic exhibitions for international and Dutch innovators, such as Henk Peeters, Jan Schoonhoven, André de Jong, Chuck Close, Carolee Schneemann, Hilarius Hofstede, Craigie Horsfield, Judit Reigl, and Pino Pinelli. Each exhibition is accompanied by related cultural and research events.